Whether you are just getting ready to graduate from high school, or you are looking at a career change, hospitality management may be a career path to consider. Getting a college degree in hospitality management gives you the skills needed to prepare you for the wide open field of hospitality. Once you have graduated, you can take several paths to apply your degree. Food and beverage managers work throughout the nation in catering companies, hotels, restaurants, and anywhere else food is served. According to the United States Department of Labor, It is the duty of the food and beverage manager to oversee all operations of restaurants and on-property food services. This can include human resources, ordering food and supplies, customer service, financial tracking and inventory. Food and beverage managers will also spend much of their time training and evaluating employees to attain top quality customer service. They may also be responsible for the discipline and conflict resolution of employees as well. A food and beverage manager can expect to make between $29,870-$67,822 a year, with the higher end of the salary range reserved for managers working in large resort hotels and exclusive properties. Degrees in hospitality management may also give you the skills to work a human resources manager for a variety of businesses in the hospitality field including restaurants, hotels, casinos and spas. A human resource manager is responsible for all duties revolving around employees. This can include paychecks, benefits, insurance, hiring, firing, and conflict resolution. A human resources manager can expect to make between $59,574-$109,938 a year, with the higher end of the salary range reserved for managers working in large resort hotels and exclusive properties. Human resource managers can also expect to make more by working in hotel chain corporate offices. 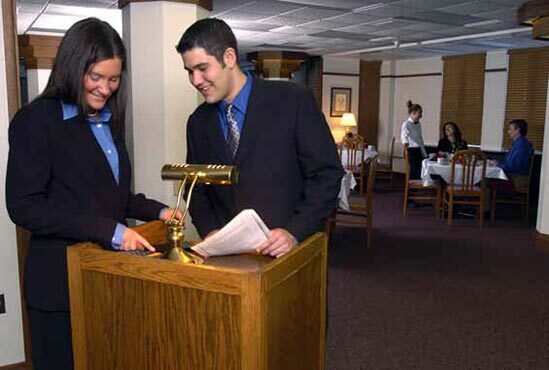 Hospitality management students may also want to consider a career path in lodging management. Lodging management includes hotels, motels, resorts, and any other property that provides lodging to travelers. Managers in this area of hospitality are in charge of the daily operations of the property. These can include marketing, employee relations, customer relations, budget, sales, and facilitating the smooth operation of the property. A manager in lodging can expect to make between $30,688-$100,525. Casinos are another area of hospitality management that students may want to consider. Casino management jobs are limited to areas of the United States where gambling is legal. This can limit the jobs in your area for employment. However, casino management can be one of the most lucrative positions in the hospitality field. With this increase in income also comes added responsibility. Casino managers are responsible for the smooth operation of the facility. They are also in charge of customer relations, facility management, employee relations, and the added responsibility of security. Since casinos have large sums of money circulating the casino floor at any time, casino managers have the added responsibility of security over the money against con artist and thieves. A casino manager can expect to make between $124,618 and $338,199 each year. Casino managers usually work their way up from casino floor security or through corporate operations. Each casino establishes its own set of standards for education and experience needed to become a casino manager. Hospitality management students may also want to consider career paths in travel and tourism management. Jobs in this field include travel agents, cruise directors, sales managers, and tour managers. These professionals are in charge of all factors that revolve around traveling. This can include booking travel, overseeing guest entertainment, managing staff, budgets, sales and marketing. In many cases Travel and tourism managers get to travel themselves throughout the United States and the World, or get substantial discounts on travel. Travel and Tourism managers can expect to make between $32,000 and $124,616 a year with the higher end of the salary range being reserved for government authorized travel agents and in-house corporate travel agents.